* Seminar rooms prices include: seminar equipment like data projector, audio, video on request, markers, screen, flipchart, Pitchers of water are available in the hall throughout the day. * Catering and coffee breaks take place separately from the workroom! We offer three different halls for festivities along with lavish banquets. In the summertime, it is also possible to celebrate your special days on the riverside of Navesti in the log shelter. We and our partners offer the best ideas so your day or evening would be meaningful. Together, weâ€™ll find the best solution for you! A good way of thanking your company employees and raising their motivation is to organise company events. For this purpose, Vanaõue Holiday Centre offers the opportunity to rent out the complex with a selection of additional services. The rent for the complex includes: accommodation in the main building for 40 and in the cabins for 60 people; using the playing fields, log shelter (200m2); the main building sauna for 5 hours; privacy. Delicious food and exciting activities will accrue to the price. 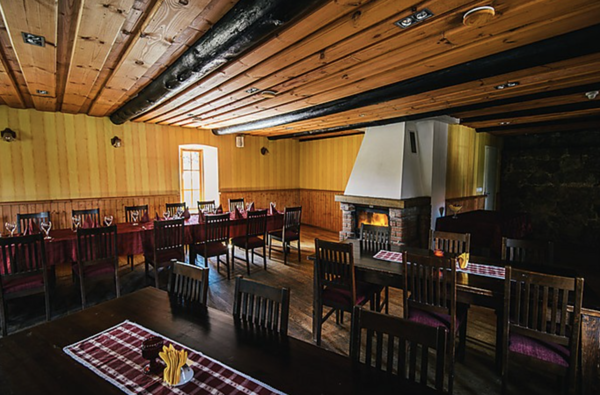 When planning a spring excursion for your class, you should also take note of the Vanaõue Holiday Centre springtime discounts for groups of children and teens: Daytime paintball forest battle with 100 bullets, Canoe trip, Lunch. For the evening: Sauna for 2 hours, Disco and karaoke, Dinner, Accommodation in the cabins and breakfast. * The offer is valid until 30 June.